There are different ways to travel from Tbilisi to Yerevan. The cheapest option is by public minibus, but I read that the Debed Canyon in the north of Armenia is very beautiful. I was looking for ways to go from Tbilisi to Yerevan whit a stop in the Debed Canyon. It seemed impossible by public transport and I was about to give up on my plans. But then I found out about Envoy tours and their Enlinking Caucasus tour. It was exactly what I was looking for. I decided to book the tour, even tough it was a bit above my budget. It was the best decision I made and the tour became one of the highlights of my travel. I read about the beauty of Armenia’s monasteries, but nothing about it’s nature. It turned out that the mountains are even more beautiful. In the bus we passed green hills and pastures full of yellow and red wildflowers. Almost every village around the picturesque gorge had a church or monastery with beautiful kachkars. These Armenian crosstones are decorated with intricate motifs. The first kachkars appeared in the 9th century. Despite Armenia’s violent past of raids and lootings by several invaders there are still about 40,000 kachkars throughout the country. Armenia’s monasteries are sober with nothing more than a simple altar and a place to burn candles. Our first stop was the 13th century church in Akhtala. The only church that still has well preserved frescoes on its walls. We also visited the monasteries of Haghpat and Sanahin. Both are from the 10th century but Sanahin translates as “This one is older than that one”. For me, the tenth century is old and the buildings were impressive for its age. Both beautiful in their austerity. The monasteries might look similar, but each has its own charm. Our guide managed to bring the monasteries alive with her stories. All of them have their own legends and superstitions. Often there is something that Armenians believe will bring you good luck. In Akhtala newly weds can pass through two rings for a happy marriage. And for those who are single, it might help in finding the right partner. In Haghpat you can walk on a small edge across the wall. It looked very easy, but nobody in our group succeeded. Even so I felt luck was with us during this whole day. But behind all this beauty there is also a different story. Our guide tells us more about the economical situation of the Debed Canyon. In Soviet times this area was very productive and a lot of copper mine factories were built. When Armenia became independent many of the factories closed down leaving most people unemployed. The factories that still operate emitt dark clouds of smoke in the air. The reason that lung cancer is much more frequent here than elsewhere in the country. The large town of Alaverdi is full of old shabby looking Soviet flats with laundry hanging outside on its balconies. We pass by several abandoned factories scarring the landscape. It makes me wonder what a horrible trade off this was for the people. The Soviets built factories that brought work and economic stability, but that polluted the landscape and caused severe health problems. Now the factories are closed, which is a blessing for the environment, but leaves people without jobs. Hopefully tourism can be a new source of income. The Debed Canyon is still an off the beaten path destination, because it is relatively far away compared to Armenia’s other monasteries. It definetly feels remote, but actually Alaverdi is only 4 hours away from Yerevan. Many tour operators have started to include the monasteries of Haghpat and Sanahin in their itineraries. Envoy tours supports a local family in one of the nearby villages by having lunch there. For me this was one of the highlights of the day. Armenia’s big pride is Khorovats (pork barbecue). The pork was grilled to perfection, but even more delicious were all the small side dishes and salads. Everything was made from fresh products. The host family was lovely and kept feeding us till we were almost exploding. After lunch we drove straight to Yerevan. The rocky mountains gave way to green rolling hills. Soon our guide pointed out the views on mount Aragats right next to us and Ararat in the distance. Our guide was so enthusiastic and so informative that when we arrived in Yerevan I felt I already learned so much about Armenia that it did not feel new to me. I couldn’t have wished for a better introduction to Armenia. Alaverdi is the main town in the Debed Canyon. There are frequent marshrutka’s (minivans) to and from Yerevan taking about 3-4 hours. 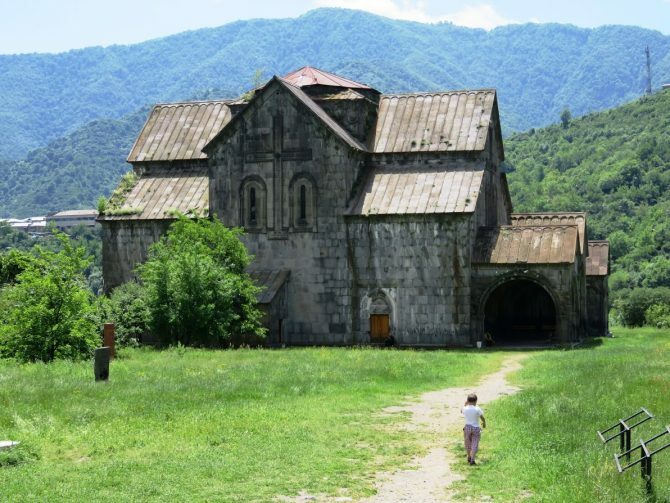 There are 1 or 2 daily marshrutka services to the villages of Haghpat, Sanahin and Akhtala, but not to the monasteries. Haghpat is still a 6 kilometer walk from the highway and Akhtala a 3 kilometer walk. It is also possible to visit Sanahin by taking a cable car from Alaverdi and walking about 2 kilometer to the monastery. If you want to visit all monasteries in a day it is best to organize a taxi from Alaverdi. However, the easiest option is to go on an organized tour. If you are travelling from Tbilisi, Georgia to Yerevan, Armenia or the other way around I can really recommend the Enlinking Caucasus Tour from Envoy Tours. They travel from Tbilisi and Yerevan with stops in Haghpat, Sanahin and Akhtala with a delicious Armenian lunch that will fill you up for the rest of the day. They also have excellent hostels in both Tbilisi and Yerevan with good facilities. A great way to meet other people and discover the Caucasus. Besides the Enlinking Caucasus Tour that I did, they also offer other tours in Georgia and Armenia. I went on that tour with Envoy in April! It might be more expensive than other tours, but so worth it! A small group, a great guide, would definitely recommend it! Getting there on public transport is a pain in the behind.